Ajith Fernando (ThM, Fuller) serves as the teaching director of Youth for Christ in Sri Lanka. 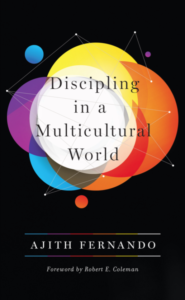 This post is from his latest book, Discipling in A Multicultural World (Crossway, 2019), which has a strong focus on practical discipleship in honor-shame oriented cultures. This excerpt from pp. 215-16 is used by permission from the publisher. It is very difficult for new believers in most cultures to accept that Christians must not take revenge. When I tell them this after someone has hurt them, some respond that I can follow that principle as a mature Christian, but it is impossible for them. In many cultures, when some- one has dishonored you, it is wrong not to restore your honor or that of your family or friend through revenge. Dishonoring the wrongdoer is seen as the way to restore honor. However much we teach about this, the natural reaction to being hit by another is to hit back. Jesus’s statement “But if anyone slaps you on the right cheek, turn to him the other also” (Matt. 5:39) is considered impossible to practice in today’s world. Here too the dual emphasis on community and the doctrine of God helps. The community changes its value system by turning the refusal to take revenge into an honorable practice—a high value. We expound this principle often in our teaching and preaching. We show how true healing takes place when there is forgiveness. When teaching what it means to obey God, we will use as illustrations vivid stories of Christians who forgave and refused to retaliate. We present the heroism of honorable forgiveness and the healing it brings. As I have said often in this book, values are changed through constant exposure to the truth. We must labor to help our people to have this transformed mind— with its new sense of values that looks at truthfulness and the refusal to take revenge as honorable things. ‹ Why Did Jesus Have to Die?